According to the Occupational Health and Safety Administration (OSHA), 2.3 million construction workers, or 65% of all construction workers, work on scaffolds as part of their jobs. Unfortunately, working on scaffolds is extremely dangerous work, and each year over 4,500 construction workers suffer personal injury scaffold accidents, and over sixty workers die each year. Most workers who are injured in scaffold accidents were hurt because of planking or supports which failed, slipping, or being hit by falling objects. The Bureau of Labor Statistics calculates that almost 75% of scaffold accidents are attributable to these causes. Other common causes of scaffold injuries are collapse of the scaffold and electrocution due to nearby electrical wires. Falls are the most likely accidents to cause wrongful death in construction accidents in Massachusetts as well. According to the Massachusetts Coalition for Occupational Safety and Health, 18 workers died in slips, falls and trips in 2015. Eight of these workers fell and died on construction sites. In addition to wrongful death, scaffolding accidents can cause severe fractures, head injuries, scarring, and disability. These types of injuries often result in huge medical bills. There may also be a long period of disability and lost wages. Worker's compensation may pay for some of the medical bills and lost earnings, but worker's compensation cannot adequately compensate an injured worker for permanent losses and disability arising from a serious scaffold accident. 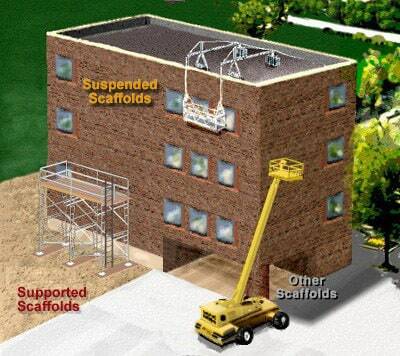 There are three basic types of scaffolds, which are illustrated below (the drawing is from the OSHA website). By far, the most common is a supported scaffold which often begins at street level and rises up the side of the building. Parts include steel pipes and cross bars, wooden or metal platforms, and attachments such as outriggers. Scaffolds are highly regulated by the Federal and state governments. Other details about the design and regulation of these scaffolds can be found at OSHA’s website. Few will forget the horrific scaffolding accident that claimed the lives of three people in Boston in 2006. According to a Boston Globe report, workers for Bostonian Masonry were dismantling scaffolding at an Emerson College dorm project. The scaffolding collapsed because it had not been properly attached to a crane. Two workers fell 14 floors down onto Boylston Street and died. Meanwhile, the construction platform fell onto a Honda sedan, killing the young doctor behind the wheel. OSHA later cited Bostonian Masonry for eight violations of safety standards and announced the company faced $119,000 in fines. Our attorneys are experienced in representing workers who suffer personal injury or wrongful death as a result of scaffold, ladder, and other construction accidents. It is critical that an immediate investigation be launched. While state and federal investigators may respond rapidly to the scene and begin their investigations, your attorney will at the same time identify evidence that must be preserved and identify and interview witnesses. Often a law suit must be started immediately to get court orders to preserve critical evidence. Investigation involves examination of the scene while the evidence is fresh. It may be necessary to get court orders to preserve evidence. Prompt investigation of witnesses is also important. After a construction accident, it is also critical to establish contact with the investigating authorities, such as the Occupational Safety and Health Administration. Of course, if you have been injured in a scaffold accident, it is also essential that you get prompt medical attention. If you were injured while on the job, then you should be entitled to workers' compensation benefits. The lawyers at Breakstone, White & Gluck, P.C., are experienced in working with top experts and getting the best compensation for victims injured or killed in scaffold accidents. We will conduct the initial investigation, preserve evidence, and gather information from witnesses while their memories are fresh. We will handle your case from intake through trial, and if it is necessary, through appeal. We will work hard to get you the best results. If you have been injured in a scaffold or other construction accident and wish to speak to a lawyer, please call us at 617-723-7676 (or toll free at 1-800-379-1244), use our contact form. Get your free legal consultation today from Breakstone, White & Gluck, P.C. Be sure to act promptly. The Massachusetts Statute of Limitations requires suit be filed within a certain time after the accident if it is not resolved by settlement.